I'm a TV junkie, I really am. It's appalling how many shows I try to keep up with, and every year I say "oh I won't start many new ones this time", yet I still do. Or I binge watch something over the summer, then add it to my list for the new season (i.e. I just finished every episode of Brooklyn Nine Nine, so I'll be watching that weekly come September). Sometimes shows start to decline, and I stop watching, others I persist with, mostly because I've probably been watching for a few years already. But which of my many shows were my favourites this year? In the last couple of years (14-15, 15-16 seasons), I've been a big fan of the DC comics shows on the CW (yes, I watch way too much American TV), and while I still watch and enjoy them, they've slipped from my list this year, as they didn't really stand out for me this year, and many have become too serious all the time, losing the comedic elements I so enjoyed. I've also left off shows like Orphan Black and Game of Thrones this time, simply because they're both starting later this year, in the summer. So, in no particular order, here's my top five from the last year. In the comic battle of DC and Marvel, most of us would agree that the Marvel films are much better, while DC dominates the television world. Agents of Shield broadcast its fourth season this year, and I've had mixed feelings about it in the past - it's been good, but nothing that blew me away. However, this year was definitely its best season, notably due to the three mini-arcs in the storytelling, rather than a 22 episode build up to the 'big bad', a formula which I'm definitely tiring of in other shows. It kept the series far more engaging, with so many twists and turns throughout, and cliffhanger endings before each mini-hiatus that left me eager to know what was next. I enjoyed the first season of Lucifer a lot, and only left it off of last year's list because of other shows I liked even more. Season 2 has been just as, if not stronger, successfully avoiding the second season slump (which I actually think more shows experience in season 3 now). Lucifer continues to be as amusingly charming as ever, while still tackling deeper issues within his personality. There was a good balance of the larger season arc mixed in with 'villain of the week' murders, and I absolutely loved the addition of Ella to the police department, adding a somewhat less serious, more humorous character to the mix. I also love Maze's character, and her burgeoning friendships with Chloe and Linda. And the cliffhanger at the end of this season, damn! I was so disappointed to hear this show had been cancelled, especially without enough notice to produce a proper final send-off, but 100 episodes is still an impressive run, and this season was written with the possibility of it ending in mind. It's a light, easy comedy for the most part, although the final scene did have me in tears! I liked this season particularly for the way they advanced the characters and gave them storylines that pushed them forwards (sometimes comedies can leave the characters quite stationary), especially in the moments where we started to see Ben growing up a little more. I think this show is at its best when we see the bond between Ben and Emma, and how well he copes as a single father. I will miss this one! Reign has been an up and down ride for me over the years, with seasons two and three not quite living up the first. However, I think for this season, its final season, it has returned to form again. I was apprehensive about returning Mary to Scotland and splitting the storyline between the three courts (Scotland, England and France), but it's been working well so far. From a historical standpoint, they've sped up the timeline, so there's no shortage of action going on - I'm curious to see where they end it! And while I do miss a lot of the characters from early seasons (it's never been quite the same seeing Mary with someone other than Francis), the remaining characters are coming into their own, and it's fantastic to see a series led by three strong, powerful queens. I felt New Girl slumped in some of its middle seasons, but it's been better in the last couple of years - it was on my list last year too. I'm glad we're getting one more season to round it off though, although this year did make movement towards closing off the storylines, especially in the season finale. There's been various opinions on the Nick/Jess saga over the years, with many people complaining that the show wasn't as good once they were together, but I was glad to see it return this year, especially now that they've changed and grown up a bit in the last couple of years. It's still as funny as ever, and I like that they manage to keep all the storylines connected in each episode. 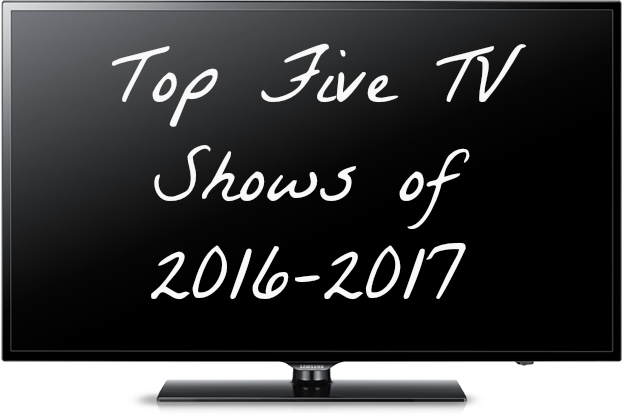 What were your favourite shows from this year? This post contains Amazon Affiliate links, and I will receive commission on any purchases. Some links lead to earlier seasons, as the newest was not available at the time of publication.